Unfortunately, it has been busier than I thought... Considerably! But hopefully, it will be worth and lead to great times soon enough (but it is still too early to tell...). After getting back to my studio place, I have been trying to sort out my old toys. I know this isn't as exciting as playing with synths, and that is in part one of the reasons I am doing it now. After checking the value of some of them, I started realising that I could probably sell everything for a pretty decent amount that should be able to provide me quite some nice gear to my studio! And better than that, I would get the chance to use those toys to make someone else very happy, just like I will happy in getting some gear I really need for my studio (wouldn't you hate to see a really nice synth or something else that you love not being taken proper care?). If I had time to take care of all those old toys, things could be different, but I can't complain about that as I will be keeping all my Legos (which I actually started collecting again together with my soulmate), which are the ones I really want exposed in my place! Unfortunately this is taking a bit longer than I thought, but in the meanwhile, I have been able to try and get some nice extra sounds programmed with the amazing Kyma! Anyway, the patches I have used with Kyma so far haven't been that creative, so don't feel bad about that! In fact, most of them consist in some chain of delays, pitch-shifters, filters, reverbs and grain modules (that use the sound that is being recorded to the memory in realtime), with some feedback lines. But as you could notice, the results are still amazing when it comes to the sound you get! But hopefully the learning process won't take forever and I will soon be able to build some really nice patches that I can feel good about sharing with you! Space has definitely been a problem, so some stuff really must go! And of course, some extra cash would be really nice as I intend to change my focus in terms of gear to stuff that is more aimed at studio production and mastering. The first acquisition I did in that direction was my new mixer, an amazing Soundtracs Solo Rack! I am not going to write much about it right now, as I haven't used it that much yet, but it feels really professional (much better than the Yamaha MV1602 I had or the Korg Zero 8 I still have) and seems to sound really nice! And I hope there will be more nice devices for this end coming soon, but it's still a nice start! My Soundtracs Solo Rack mixer! 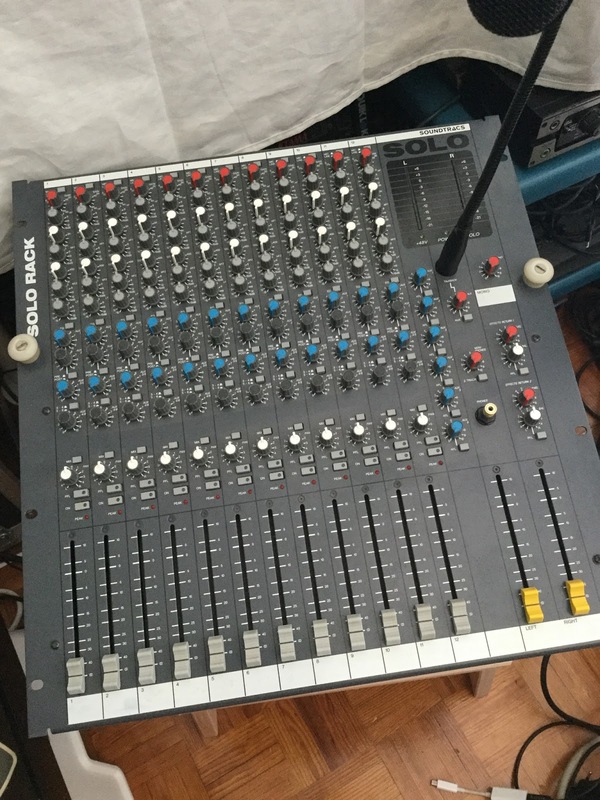 Seems to be a pretty nice mixer and my unit is in really nice shape! This week will be a bit busy still, as I need to test some gear I am intending to get rid off, but hope I'll be able to finish the posts about my previous performances and that you will enjoy it! I think this is all for now, and thank you all for checking this blog even without many posts being made recently (which is something I again apologise for...).